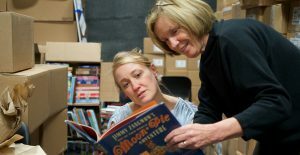 In the first two installments of this blog series, we discussed why particularly chosen books matter and how the TCRWP Classroom Libraries were selected. In this final part of the series, we will explore additional, innovative ways that the team focused on driving reading engagement. But even with the aid of exciting tools like interactive sticky-notes, if students are not given high-interest books that they can actually read, they will not flourish as readers. So how do you foster engagement for kids who are reading below the benchmark level?